The south-west monsoon barely touches Chennai. But the day Sivaji: The Boss was released to packed theatres in Chennai, it started to pour from early morning cooling the entire atmosphere. And guess what is the punch line which Rajnikanth, the mega star of Tamil movies, frequently delivers in Sivaji? "Cool". Sivaji has broken all records in the history of Indian cinema. The budget of the film is said to have crossed over Rs 100 crore, and Rajnikanth has been offered a fee of Rs 40 crore, which is probably the highest an actor has ever charged for a single movie in Asia. Besides the digital ones, over 400 Tamil and 300 Telugu prints of the movie have been released. So, what is Sivaji — the film that was simultaneously released in India, the US, Canada, Europe, Singapore, Malaysia, Sri Lanka and Australia — all about? The story of the movie revolves around a man who comes from the US (an NRI called Sivaji) to serve his country and fight corruption. He wants to serve the poor by opening hospitals, schools and colleges for them. But a villain of a politician called Adiseshan (played by Suman) is his main hurdle. After Rajnikanth, the best acting was by Suman, who as Adiseshan, dressed in a spotless white dhoti and shirt and with a Texan swagger like George Bush catches the imagination of the audience. The movie opens with the shot of a man being sent to jail. The story flashes back and as it unfolds Sivaji woos Thamizhselvi, played by the beautiful damsel Shreya, and marries her. Adiseshan had connived with corrupt bureaucrats and sent Sivaji to jail. But then, as in movies, Sivaji returns by escaping from jail and wins his battle as a crusader for justice. But now he is known as M.G. Ravichandran, aka MGR. The music by the inimitable A.R. Rahman makes the audience tap their feet in the theatres. Art director Thota Tharani created unimaginable sets to go along with the songs, while scriptwriter Sujatha made a mark for himself with his sharp dialogues especially penned for Rajnikanth. And, of course, the director Shankar, none of whose movies has ever flopped, is the biggest star of them all — he created this spectacle with a galaxy of stars. A small show was held for the distributors, who had already bought the rights during the muhurat but none of their family members were allowed during the screening. This increased the curiosity of the people more and also the mega hype over the movie. The hype over Sivaji was so much that a party was hosted as far away as Illinois in the US to mark the countdown for the release of the Tamil movie. This is unheard of. On Sunday, June 10, non-resident Tamilians partied at Naperville in Illinois and shook their legs not to hard rock but to the songs of Sivaji. Tamils abroad organise musical events where classical artistes perform. But a party with the songs of a movie which was yet to be released is a first. According to Dharini, an NRI who attended the Naperville party, "It is common for us to drive hundreds of miles when Dayanand Saraswati or Sri Sri Ravishankar are in town. No one had thought of a bash for a Rajni film." Said 14-year-old Praveen Ramesh from Foster City in California, who acts in his school plays and is in Chennai for his Upanayanam, "I like Rajnikanth’s qualities as an actor. He has good poise and when he is acting, one can make out that he really enjoys his role." Such is Rajnikanth’s fan following that Sivaji is also being dubbed in Chinese for release in South East Asia and Hong Kong. According to ‘Pyramid’ Natarajan, who bought the distribution rights for Sivaji in Malaysia, "There is a huge Malay-speaking Chinese population out there and they like Rajnikanth. If this film is big, Rajni will emerge bigger." Rajnikanth even has Japanese fans. Watching Rajnikanth acting in Muthu, 30 to 40 per cent of the country’s youth became his fans and one of them, Sumara, even put up a huge poster of the icon at his house to have a look at it daily. The Japanese have even named a pickle after him and it is common to find posters of Rajnikanth in restaurants and bars serving "sake and sushi". Other than capital Tokyo, he also has fan following in Osaka and Kyoto. According to Sakura Ozaki, Japanese vice-consul for culture in Chennai, Rajnikanth’s dances and mannerisms are quite different to the ones the Japanese audience see in Hollywood blockbusters or serious Japanese movies. It is refreshingly different, she says. But there is bad news for Rajnikanth’s Japanese fans. They have to wait for two months to watch Sivaji. How big is Rajnikanth’s fan following? While North India’s ‘Big B’ Amitabh Bachchan has only 20 registered fan clubs, Rajnikanth has 63,000 registered fan clubs worldwide — from Canada to Japan. But then, neither AVM Productions nor the distributors, wanted to take any chances over the day of the release of the movie. Since the next day after amavasya (which happened to be June 15— Friday) is not considered to be an auspicious day, according to the Tamil calendar, a small premiere was held on the day of amavasya — June 14. Special prayers were also held for the success of the film. The next day the rain gods did bless Sivaji and the movie opened as early as 7.30 am not only to packed theatres but also booked full for the next three weeks. People even bought tickets at a premium, paying Rs. 1000 for a single ticket. People came to watch the film in Chennai not only from as far as Mumbai but even from Bangladesh. Said Prasanna, a software engineer, who is a Rajnikanth fan, "I have watched all his movies. But there is no parallel to Sivaji. It is simply superb." Journalist Shobha Warrier became nostalgic after watching the opening show. "It reminded me of going to a planetarium as a child clutching my father’s hand and watching the stars in a dark theatre. What triggered off that memory was Rajnikanth’s Sivaji. "Inside the dark theatre, I was treated once again to a spectacle for more than three hours. As I watched, I was extremely happy and most of the time, the child in me got very excited," she said. From young to old, irrespective of gender, class, creed or caste, those who were lucky to watch the opening show on the opening day were unable to suppress their excitement. The general reaction was: "Rajni, (as he is fondly called by his fans) has done it again and proved he is a maga star par excellence. 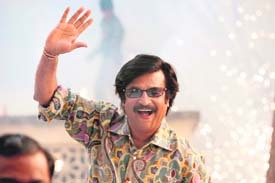 Sivaji will break not only his previous record of box office hits but also all records in the history of Indian cinema. Rajni has created history in the world of cinema." AVM Productions and the distributors for Sivaji had reasons to celebrate as on the opening day it mopped up a whopping Rs 1.7 crore from ticket sales only in Chennai alone. The movie was released all over South India and ran packed houses even in Karnataka where there were initial protests by some Kannadiga associations against the release of a Tamil movie. In the neighbouring Andhra Pradesh, Rajnikanth had gone to seek the blessings of Lord Venkateswara at Tirupathi before the release of Sivaji. After offering his prayers, he said, "The story revolves around the circulation of black money and director Shankar has done a great job. Shankar is a great director and there is no doubt that the movie will be a box office hit." Who is Rajnikanth whose popularity can put any South Indian politician to shame? Sivaji Rao Gaekwad was born on December 12, 1949, as the fourth child of a Maharashtrian couple, Ramabai and Ramoji Rao Gaekwad, living in Karnataka. Hailing from a poor family, he started working as a bus conductor in Bangalore. Cinema was his passion and he wanted to be an actor. He saved money to reach Chennai and joined the Adyar Film Institute to study acting. He had a tough time staying in a room in a run-down lodge as no one would rent him a room in a decent locality since those days he drank and smoked heavily. His first break came when filmmaker K. Balachander offered him a role in Apporva Raagangal. At that time a hit Tamil movie Rajnikanth was running to full houses in Chennai. So, the former khaki-clad bus conductor Sivaji Rao Gaekwad donned the name of Rajnikanth. Since then, Rajnikanth has never looked back and has been ruling Tamil film industry for the last 32 years. However, it has not been a cakewalk for Rajnikanth as he has many a time had a brush with politicians. In an interview a decade ago after he became a star, he said, "Tamil Nadu has become my preferred home because people of this state have given me a new identity and my modest claim to fame. "When I left Bangalore, I wanted to be an actor, not a star, because of three things: It would fetch me a little more money than the salary of a conductor. I could choose my women and get plenty of time to sleep — in that order. I have achieved much more. I want nothing more," he said. That was the 1980s. He recalled that once he had gone to the then leading heroine of Tamil cinema and later Chief Minister Jayalalitha’s house in Poes Garden to discuss a small role in a film in which he was playing second fiddle to her. "I was riding a scooter, something I was sheepish about. The film didn’t work out for various reasons. It was at that moment that I decided that one day I would have my house in the same area she lived in — Poes Garden — so that I could shed the complex once and for all. I have done that now," Rajnikanth said. But it created a problem. By 1990 Rajnikanth had become a super star with a huge fan following. One day in 1992 Rajnikanth was driving down Poes Garden to reach a studio for shooting. He was stopped by the police who said, "Madame Chief Minister will be leaving her residence and all traffic has been stopped to clear way for her convoy." The Chief Minister was Jayalalithaa. Rajnikanth requested them to let him pass as he was already late for his shoot but the police did not oblige. He then promptly parked his car and got out to walk down to the crossing of Poes Garden and Radhakrishnan Salai. He bought a pack of cigarettes from a roadside shop and lit up one in his typical style. First, a small crowd gathered to have a glimpse of their favourite actor. Then as word spread thousands thronged the area and total chaos prevailed. Jayalalithaa could not even come out of her residence because of the swelling crowd. The police begged Rajnikanth to leave. To teach them a lesson, Rajnikanth shrugged and said, "I am waiting for her to go. I don’t mind waiting." Later in the day, Jayalalithaa reportedly called up Rajnikanth and asked him to shift his residence as it was creating traffic problems. Rajnikanth had shot back that why could she not shift to another residence. Before the Lok Sabha elections in 2004, Rajnikanth had a tiff with the founder member of the Pattali Makkal Katchi (PMK), Dr. S. Ramadoss, the moral police of Tamil Nadu. Ramadoss had taken offence to the star’s drinking and smoking onscreen in a movie called Baba, one of the rare Rajnikanth movies which flopped at the box office. Rajnikanth took on the PMK and asked his fans to defeat PMK nominees. And despite his best terms with Dravida Munnetra Kazhagam (DMK) patriarch and present Chief Minister M. Karunanidhi, he asked people to vote for the Bharatiya Janata party candidates. The PMK and the DMK were in an electoral combine with the Congress which was contesting against Jayalalithaa’s All India Anna Dravida Munnetra Kazhagam (AIADMK) and BJP front. The DMK-PMK-Congress alliance swept the polls and won all the 40 Lok Sabha seats in Tamil Nadu and Pondicherry. Rajnikanth realised his folly and swore never to dabble in politics like all other film industry people who have been ruling Tamil Nadu since ages. Compared to the Big B who does seven to eight films a year and charges Rs 3 crore per film, Rajnikanth does only one film in two years but charges a whopping Rs 35 crore for each film. He had even made his mark in Hindi movies and acted in Giraftaar as police officer along with Amitabh Bachchan. But such is his humility and respect for Bachchan that he says, "There could be no comparison between me and him as he is a very tall personality. I am too small for him." Neither has the mega star forgotten his old friends. Raghunandan, who was a waiter in a hotel in Bangalore, was sacked for trying to sneak out food to a hungry Rajnikanth. After much pleading, he got back his job after a year. Rajnikanth walked into the same hotel after a few years but as a star and asked Raghunandan and Rajbahadur, the driver of the bus in which he worked as conductor, to accompany him for a walk in Bangalore. Recalls Raghunandan, "While we were strolling, Rajni saw a pet dog inside a rich man’s bungalow and said: ‘See he gets good food and comforts but is not free like the other street dog which is roaming the streets and eating from the garbage. You are free but I am like a dog imprisoned inside a bungalow.’ We all laughed." Till date Rajnikanth has kept in touch with Raghunandan and Rajbahadur and looked after their well-being. And now after mega hit Sivaji: the Boss, Rajnikanth is likely to remain the "Cool Boss" of Tamil Nadu for more time to come. Sivaji was released at 600 theatres all over India. Tickets for the weekend shows in the US were booked 10 days in advance. In Tamil Nadu, 300 prints were released. In Thanjavur in Tamil Nadu, the first show was screened as early as 3 am, while in Palakkad in Kerala the first show was screened at 5 am. Fans poured milk, coconut water and even beer on Rajnikanth’s huge cut outs as abhisekham. Many turned up to watch the movie dressed as Sivaji look alikes. Among the politicians who watched the movie at special shows were Tamil Nadu Chief Minister M. Karunanidhi and former Andhra Pradesh Chief Minister and Telugu Desam Party chief N. Chandrababu Naidu. Jayalalithaa too watched a special screening at AVM studios and her comment was: "Excellent". Sivaji: The Boss is the first Indian film to incorporate the latest 4K resolution technology that is used only in big-budget Hollywood films. In India, 2K resolution for digital intermediate (DI) is the set standard. Around 400 of the 2,900 prints of Sivaji have been made in digital format by Prasad EFX, one of the largest digital post-production studios in the country. The studio has colour graded and post-produced the film. Considering the superior imagery that has been cinematographed by K.V. Anand for Sivaji, the processor for the film, Prasad group, felt that 4K would do justice to the film by enhancing its digital image quality and flexibility in colour grading. AVM, the producers of Sivaji, have also gone ahead with the process considering the advantage it would have despite an increase in the cost of production. "By routing the entire film through the 4K pipeline for the DI process, we can be certain that none of the details available in the celluloid film are lost," Madhu of Prasad EFX said. "Another advantage is that when we can scale up the images during the post and graphics processes, the image will not go soft. As a 4K image has larger resolution, we can also have unlimited freedom in manipulating the colours during grading. "Our meticulously colour-calibrated environment ensures that what the cinematographers see in our facility is what is actually seen by people in the theatres," he added. The entire 4K DI process was done in Prasad EFX’s Chennai facility, using high-end scanners, film recorders and colour grading suites. Prasad simultaneously worked on around 85 per cent of the VFX, or graphics, in Sivaji, also in 4K resolutions. Technically, the movie can perhaps be rated as the best ever produced in India.